Put sliced noodles into 2 bowl (600ml) of boiling water, cook for about 4 minutes, stir well with chopsticks. Shut down the heat, add with soup, sauce sachets, ready to serve. Ingredients: Noodle: Wheat Flour, Salt, Water. 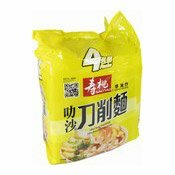 Soup Sachet: Salt, Sugar, Flavour Enhancer (E621), Seafood (Fish) Flavour, White Pepper, Flavour Enhancer (E635), Creamer (Coconut Oil, Corn Syrup, Spices, Colour (E160i), Curry Flavour, Dehydrated Leek. Sauce Sachet: Palm Oil, Chilli, Garlic, Shallot, Seafood (Fish) Flavour, Soybean Paste, Salt, Sugar, Flavour Enhancer (E621, E635), Spices, Colour (E160c), Preservative (E202).